Power delivery systems, particularly distribution systems in the United States, whether they are overhead or underground, have always been vulnerable to the effects of major storms. In fact, virtually every utility has had to respond to a major storm event in its history. Some utilities, because of their geography, must deal with such events nearly every year. For most utilities, “storm events” include hurricanes, tornadoes, windstorms, thunderstorms, lightning, sleet, snow and ice. The graphics below, from a 2006 report by Macrosoft Inc., show the number of outage events per year and the primary cause of outages, from a survey of 45 utilities across North America. The results of the study confirms that a majority of utilities (87%) face an emergency outage event at least once per year and 23% face it more than 5 times per year. In 2009, the DSTAR consortium commissioned a study of the best practices for utility storm response. The 124-page comprehensive report examines the practices, procedures and experiences of U.S. utilities during major storm occurrences with the goal of understanding and conveying what went right and what went wrong during the build-up, restoration and ramp-down phases. 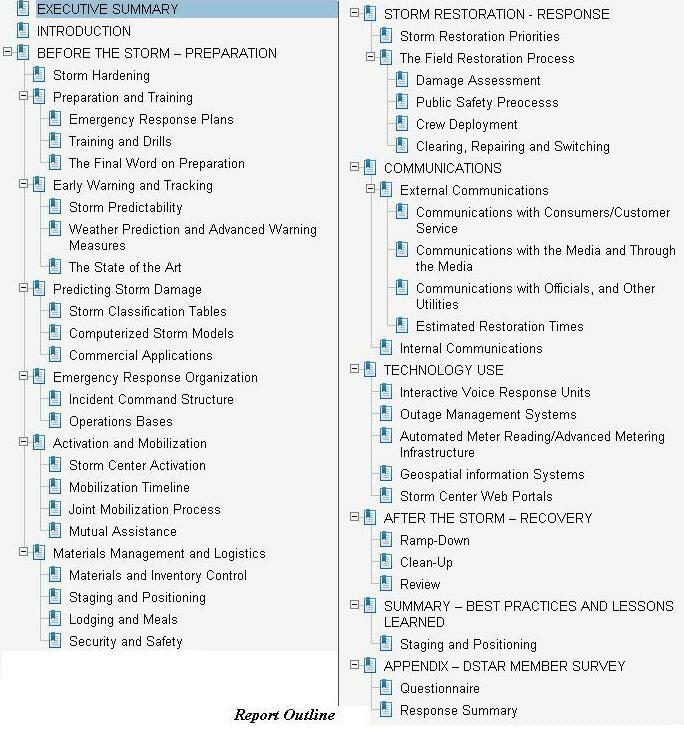 This includes appreciating how utilities harden their systems to withstand storm elements, how they prepare, train and drill storm-duty personnel, available tools and processes for storm tracking and damage prediction, how they organize and manage response activities, procedures for assessment, repairing and switching, communications and technology use. The investigation included: a detailed survey of DSTAR member utilities on a wide range of storm response issues; interviews with utility personnel, vendors, manufacturers, researchers and consultants; extensive review of relevant literature including industry publications, conference proceedings, whitepapers, utility storm reports and public commission assessments; and examination of utility, vendor and manufacturer websites. The result is comprehensive discussion of many important aspects of storm restoration with an emphasis on best practices and lessons-learned from past experiences. The findings have been summarized as 144 recommendations and lessons-learned from utility storm experiences.